Speed and Strength is known for their well made street motorcycle apparel and now Speed and Strength has manufactured a stylish and safe D.O.T. motorcycle helmet that will keep your head protected while riding. 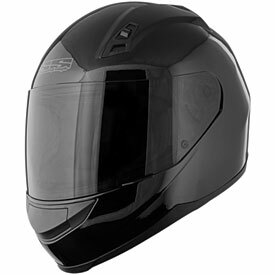 The Speed and Strength SS700 Solid Speed Motorcycle Helmet comes with an "All Clear!™" face shield that meets or exceeds D.O.T. standards. "A.T.P.A.™" Advanced Thermo-Poly Alloy Shell. Removable, washable and moisture wicking liner. "Airstrike™" direct course ventilation system. "Lock 'N Load™" rapid conversion shield replacement system. "All Clear!™ Sight System" optically correct, anti-scratch, and UV resistant faceshield. I got this helmet for me and one for my fiancé. They are awesome for the price, cannot get a better helmet for the money you pay. Got this for my wife since she has an older helmet and needed an upgrade. I didn't want to order it at first just due to the fact that there wasn't a lot of reviews, but it arrived today and it looks awesome! Has a great fit on my wife, even fits me being a medium. Has a nice feel on the outside as well as the inside. Visor is really easy to take off and put back on. It did come with a clear visor even though it is pictured with a dark visor which didn't bother us at all. All in all, pretty decent helmet, looks better than my Bell. Great helmet No tinted shield like the picture! I purchased a large and it fits great. I love the ratchet connection very fast and easy. only issue is the way Speed and Strength advertises their product to make you believe the shield is tinted. That is not the case it comes clear. Otherwise its a great helmet i would recommend to anyone. Does the helmet breathe well? Does the helmet block out a lot of wind noise? BEST ANSWER: This helmet receives good reviews.